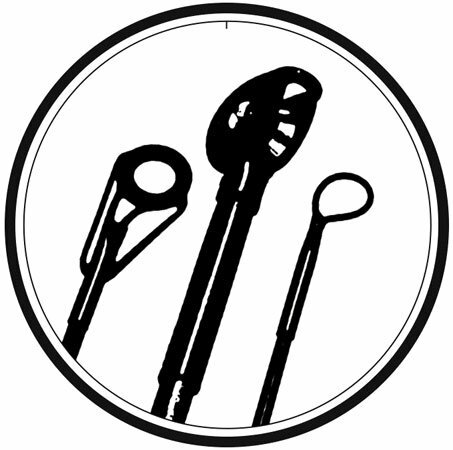 The International Symbol for Custom Rod Building was designed to provide a unique identifying moniker for those who practice the art of custom rod building. Bold black artwork on a white background shows 3 tip tops that identify the major types of fishing rods - casting/spinning, trolling and fly. As of August 2018, over 85,000 decals featuring the symbol have been distributed to custom rod builders around the world. Those wishing to obtain a free decal for themselves may send a 5X7 inch SASE to: Int. Custom Rod Symbol, PO Box 1322, High Point, NC 27261. Please limit requests to 2 decals per person. *Copyright Information - The International Symbol for Custom Rod Building is copyrighted and unauthorized use is prohibited. The copyright owner grants permission for custom rod builders to use the symbol on their websites and business cards/brochures at no charge. Use of the symbol in any for-profit capacity, i.e. sales of clothing and related merchandise, requires written permission from the copyright holder. Please contact the copyright holder at [email protected] for artwork and/or copyright use permission.